Capsule Summary: Father Mulcahy gets anxious when the Divisional Chaplain arrives for an inspection; Frank gives up on a patient only for B.J. to save him; Klinger keeps trying to escape; Hawkeye tries to cram enough people into a jeep to break a world record. And it all gets jotted down in B.J.’s letter to his wife. I always enjoy the letter episodes – you see so much through the eyes of the letter holder – and I think Ned Beatty going “over the top” was not so much part of who the actual character was – he was showing Father Mulcahey how to go “over the top” to grab their attention. I always thought that Hollister did it that way on purpose – to show Father Mulcahey how he needed showmanship to get “their” attention. He kind of does the same thing when he writes the premature “your son is doing fine” letter. After so many of the televangilists I’ve seen, he seems pretty right on, and not so far fetched as it might seem. I watched this episode some time ago and I don’t remember much of it, but what comes to my mind is the scene when they set the jeep record and the visiting chaplain asks BJ if Fr. Mulcahy supports/encourages (I didn’t watch the original version) things like that and BJ says he should ask him about that and Mulcahy is seen getting out of the jeep. Oh, what a long sentence, but that was a nice scene. Wish we had priests like Fr. Mulcahy in Poland! A cute episode. A classic quote I always said to my wife when she was alive…..”I just noticed its been 2 pages since I told you I love you……It’s two pages later now and I love you even more…” A very romantic line I think…I would tell her….Instead of “pages”, I would substitute this……Its been 2 hours (or sometimes minutes)since I told you I love you…Its two etc…..etc…etc………..
I’m with Pinky, Hollister kind of comes off as these fanatic televangelists… or, in a sense, a (southern) Baptist minister type… he, to me, kind of comes off as the Bible-thumping type without necessarily living quite a Christ-like life himself. It does bring up an interesting point though, Mulcahy never really asserts himself, but then again, that goes against his character: he wants people to want to seek God, not having to prompt people into wanting to seek Him. I would say this is a pretty average episode… not one that I would watch over and over again, but it’s still enjoyable at times… I think my favorite thing fromt his episode is the trying to teach Koreans English: “YOU TERR ‘EM FERRET FACE” kills me every time. I like the episode. It’s busy, but it works really well. I guess the only part I have a problem with is Hollister making Mulcahy send the premature letter. I really didn’t get anything out of Hollister’s show of force after the service where stupid Frank said it was a pleasure to be in the presence of a real spiritual leader or something like that. Mulcahy’s spiritual presence as a priest showed best in the episode with Cardinal Reardon (Blood Brothers). I love Hawkeye’s attempt to teach Frank taunts to the Koreans. The one time Father Mulcahey does get a little “showy” is when he does the sermon over the radio about the stolen money – I don’t think it was payday, I think it was Change Day. That’s the episode you’re thinking of. An enjoyable episode, especially Hawkeye and Frank teaching English to the Koreans. BJ: War is an organized bore. Yes, that’s the correct episode. My first post/ comment/ time on this site..what a goldmine for m*a*s*h fans- Doc Funnypants- love it! I’m going to nitpick a bit but it’s out of love for the show because I wish everything could be done perfectly. It bothered me the way Mike Farrell pronounced Volkswagen with the hard v sound for the w. I know it’s the way the some Germans pronounce it, but considering he’s playing an American who doesn’t speak German or have any connections to Germany, in the 50s discussing a car that’s still pretty new in America at the time, it doesn’t fit the character. He’s not even pronouncing it that way for the character since he’s supposed to be reading a letter in his head. The actor wasn’t skilled enough to realize that the character would not pronounce it that way at that time. On a related note, Mike Farrell bothers me sometimes. His personality is such that he thinks he’s a better actor than he actually is. Talking too fast, the fake crying that’s very obviously fake, and the manufactured outrage at the way some people cope with war. (You can’t! She’s married!) He has said in interviews that he was a co-lead with Alan which is nonsense. 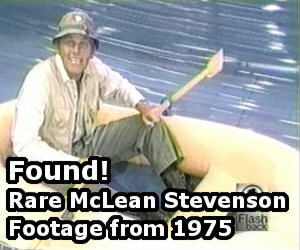 Did he really believe if Trapper wasn’t considered a lead that he was? Alan Alda recently did an interview where he talked about how certain characters had way too many puns written for them. He says they weren’t particularly funny unless they were classic puns like Gelbart wrote. He specifically pointed out the years after Gelbart was gone that the puns got out of hand and some actors relied too much on them. Almost all BJ’s jokes are puns. It is rather annoying and it seems Alan may have thought so too. I love MASH but I’m Team Trapper all the way. The fact that he and Alan stayed friends the rest of his life indicates that he preferred Trapper too. The chemistry was certainly there.